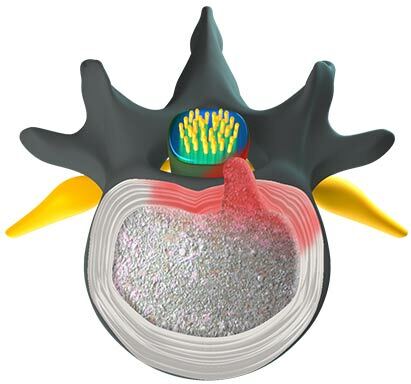 A lumbar herniated disc is when the inner core of a disc in the back herniates, or leaks out of the disc, and presses on an adjacent nerve root. A lumbar herniated disc may occur due to trauma or be spontaneous. Something as simple as a sneeze can herniate a disc. Because there is limited space in the spinal canal, even a small lumbar disc herniation may impinge on one of the nerves and cause significant pain. While back pain may be present, the most common pain is in the buttock, with radiation to the feet of the affected side. This will follow the normal distribution of the nerve affected. Numbness and tingling may also be reported. This is called lumbar radiculopathy. Most herniated discs tend to shrink back into the disc space or dissolve over time. Conservative care is recommended first unless the patient has signs of paralysis. Once a disc has been herniated, disc degeneration is expected due to the loss of the integrity of the disc.